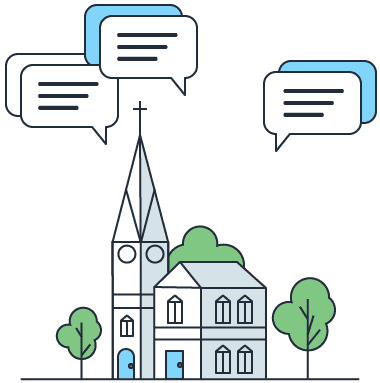 Our group texting service for churches can help your church or ministry improve communications and reach people where they already are—on their phones. Why Do Churches Use Text Messaging? Thriving churches across the nation use text messages because they're a powerful, proven way to connect with congregations. People want to text and connect with their religious community. Don't just take our word for it. Look at the numbers. of text messages are opened within 3 minutes. Even in a busy world, texts help you get in front of your church members. of Americans say they believe in God. But on average only 36% of people identify as weekly religious service attendees. of people prefer texting over phone and email. Keep your members informed by connecting with them instantly. Your church or youth ministry can use text messaging and mobile marketing to connect with your congregation and community. Our SMS service allows churches, ministries, and other religious organizations to deliver important messages or alerts via our easy-to-use text messaging platform. Hundreds of pastors and community leaders choose our platform for our easy-to-use, powerful features. Send your messages from an easy-to-remember number, 555888. Members can text this number to receive your church’s latest updates and information. Set up a custom phrase or word that members can text to your short code to opt-in for messages. Add unique keywords for different church events! Send updates, bible reading plans, prayers or invitations to all of your members via text in just a few clicks. There’s nothing for them to install. It just works. Organize your members in a way that works for your church. Create a list just for volunteers or a list just for students. Send highly relevant messages, every time. Our church texting service lets your pastors or ministry leaders have personal conversations with members. Manage replies in one user-friendly inbox. Connect with a younger audience and make your texts more engaging by including photos, gifs, audio files, and video files with MMS (multimedia messaging). Perfect for follow-up messages or bible reading plans, Autoresponders are pre-scheduled texts that send automatically after a few days, weeks, or months. Our data collection feature lets you request more information from subscribers such as first or last name. Use this info to make your texts feel more personal. Spread your mission and bring more people into your church with these six tried and true methods for increasing church attendance. Learn how to engage and cultivate a relationship with first time church visitors through texting. Use texting to help your congregation stay engaged the full 40 days of Lent and beyond. Churches, synagogues, and other religious organizations are using text messaging and SMS in innovative ways to stay connected with their congregations. Whether you need to let your parishioners know about service opportunities or raise money for a mission trip, text messages can help you build better relationships. Sometimes a newsletter isn’t enough to spread the word. Use a church texting service to inform people about upcoming sermons, bible studies, mission trips, and other events. Use texts to automatically follow up with first-timers. Make them feel welcomed and they’ll keep coming back. Never miss another opportunity for outreach and discipleship. Send important messages or alerts to your church members and community using a channel they use and are familiar with. Texting isn’t just for talking. Our platform makes it simple to create fundraising campaigns and send out donation links. Setting up your church texting service with SimpleTexting is easy and convenient! You can upload contacts one at a time or as a mass upload using spreadsheets. When you upload contacts, you’ll have the option to upload them to a master list or load them into groups you created and customized. Groups help you more strategically reach out to congregants since not every message you want to send will be relevant to everyone on your list. Segmenting groups can help you lower costs and stretch your budget in a positive way. Use Texting to Empower Your Church Today, for Free. It's risk-free to get your church or ministry started with SMS messaging. Sign up for a free trial of our texting platform and get 14 days of access to all of our features. You'll even get 50 outgoing messages at no charge. "It’s scary to even think of how many people wouldn’t have told us about their decisions if we didn’t have this really simple, clean opportunity for them to take advantage of." "Before texting, we relied on calling and emails. These weren’t effective. With SimpleTexting, it’s been much easier to reach out and connect with people." Love Your Neighbor. Text Them, Too. Text messaging can never replace personal connection, but it can empower it. A church texting service lets you reach people’s phones, and hearts, one message at a time.